How many layers does Earth's atmosphere have? Does the International Space Station orbit inside Earth's atmosphere? Does the atmosphere get colder and colder the higher we go up? The Earth’s atmosphere extends from the surface of the Earth to about 10 000km up – where it merges with the solar wind. The atmosphere is divided into five main layers. The boundaries between the layers are not rigid and absolute. Atmospheric and solar conditions affect the layer boundaries. This is the lowest layer of the Earth’s atmosphere. It extends from the surface of the Earth to about 12km altitude1. Most of the water vapor in the atmosphere is found in this layer. This is the layer where most of the Earth’s weather happens. About 80% of the mass of the Earth’s atmosphere is found here. The atmospheric pressure at the top of the troposphere is about 1/10th of an atmosphere (the pressure at sea level). The temperature decreases with altitude – with temperatures around -60°C at the top of the Troposphere. This is the second lowest layer of the atmosphere and extends from approximately 12km to 50km. It contains the ozone layer. Above approximately 30km altitude, the atmosphere above is so thin that it appears black because of diminished Rayleigh Scattering. About 99% of the mass of the Earth’s atmosphere is found within the troposphere and stratosphere combined. The atmospheric pressure at the top of the stratosphere is about 1/1000th of an atmosphere. The temperature increases with altitude, from approximately -60°C at the bottom to 0°C at the top. This is the middle layer of the atmosphere and extends from approximately 50km to 85km. Most meteors burn up in this part of the atmosphere. This is the highest layer in which clouds are found – they are known as noctilucet clouds. The atmospheric pressure at the top of the mesosphere is about 1/100,000th of an atmosphere. The temperature drops with increasing altitude, from approximately 0°C at the bottom to a chilly -90°C (or colder) at the top. 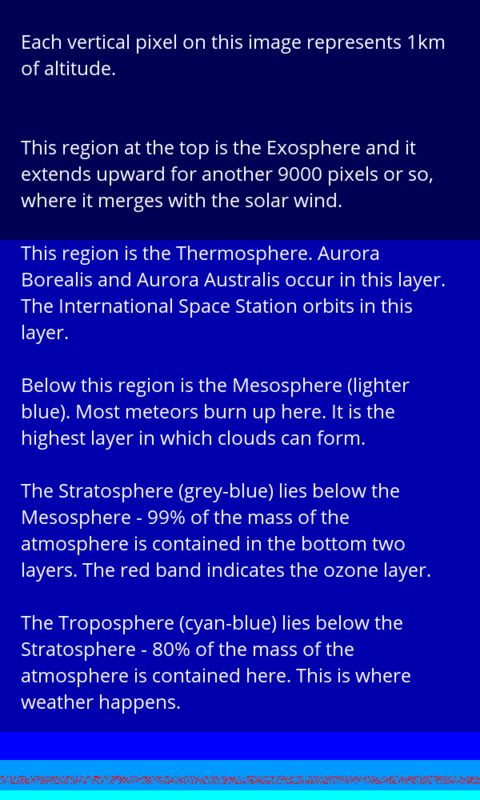 This is the second highest layer of the atmosphere and extends from approximately 85km to 700km. The ionosphere is contained in this layer. The atmosphere is so thin in this layer that atoms or molecules, on average, travel between 1 and 100 km before colliding with other atoms or molecules. The aurora borealis and aurora australis occur in this region of the atmosphere. The International Space Station orbits here. It is a very hot layer, with temperatures exceeding 500°C. This has more to do with the kinetic energy (speed) of the atoms than anything we might perceive as “hot”2. This is the highest layer of the atmosphere and extends from approximately 700km to 10 000km where it merges with the solar wind. Like the thermosphere, it is extremely sparse and “hot” – highly energetic atoms and molecules can travel hundreds of kilometers without colliding. The first four layers are characterized by their temperature profiles (increasing or decreasing temperature), this layer is characterized by the ease with which atoms and molecules escape the pull of Earth’s gravity – they move quite freely between the atmosphere, space, and the solar wind. Most satellites orbit in this layer. The last two layers of Earth’s atmosphere resemble a vacuum much more than anything we might consider an “atmosphere”. The International Space Station orbits inside Earth's atmosphere in the region known as the Thermosphere. 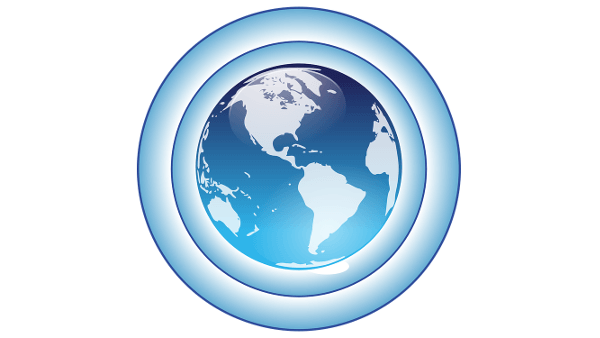 Most satellites orbit inside Earth's outer atmosphere known as the Exosphere. Altitudes above 8km are considered lethal for humans. The coldest spot on Earth about 85km up, in the Mesosphere - where temperatures can be below -90°C. In the Thermosphere, atoms travel between 1 and 100km before colliding with another particle.